In 1985, Melina Mercouri, Greek Minister of Culture and Jack Lang, French Minister of Culture, came up with an idea to pick a European Capital of Culture once a year, in order to connect people in Europe and to raise awareness on common history and values. The project officially started in the same year, after resolution of EU Ministers of Culture. This initiative soon became one of the most prestigious events in Europe. Since then, more than 40 European cities has held the title European Capital of Culture. Each year, the selected cities (in 2015 these are Plzeň and Mons) are examples of richness and diversity of European cultures. The European Capital of Culture was established in order to emphasise richness and diversity of European cultures, strengthen cultural connections between citizens of Europe, connect people from different European countries, meet other cultures, promote mutual understanding and strengthen the sense of Europeanism. The most important heritage of the project is placing culture in the very centre of social development and seeing culture as the key factor for economic development of the society founded on knowledge, innovation and creativity. Many capitals of culture used this opportunity to develop cultural infrastructure, enable wider access to culture, improve image of their cities, develop tourist economy, and strengthen cultural and creative industries during the project and after it. The City of Novi Sad has made the decision to bid for the title of European Capital of Culture in 2021, when it will be available for cities and countries outside the European Union for the first time. Following positive experiences of other capitals, the project Novi Sad 2021 is envisaged as a platform for development of cultural and creative potentials of the city, whose goal for the following period is to strengthen cultural vitality of the city, enable urban regeneration, improve international image and tourist offer of Novi Sad. In this way, while working on the candidacy for the European Capital of Culture in 2021, the City of Novi Sad would develop its local concept and strategy of sustainable development of the cultural sector focusing on: strengthening institutions of culture, preserving cultural heritage, improving cultural participation, developing cultural and creative industries, decentralisation and inter-sector cooperation. 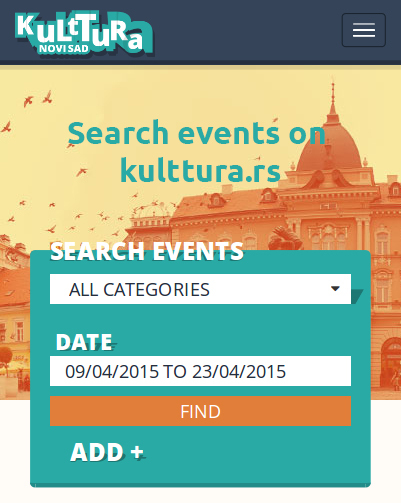 Read about European Capitals of Culture at website of the European Commission.